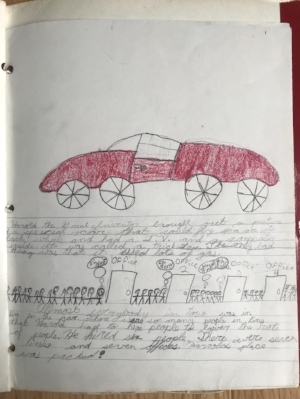 When I was eight years old, I wrote a book called The Polluting Car. It’s the story of Nancy, a woman who reshapes the auto industry, heals the planet, and becomes a millionaire by inventing a car that runs on smog. Smog was a tangible environmental crisis in California in the eighties, and as my book notes, “it was very seriose.” Aside from fixing a pressing environmental and health issue, the car invention was also a money making business. If you had invested in Nancy’s car business, you would have invested in women, gotten positive social and environmental results, and had competitive returns- Impact Investing, in a nutshell. I kept the “book” in my office for many years, and when my old firm sold and closed two years ago, I thought I lost it in the shuffle. Since I had figured it would have to just live on in my memory, imagine my excitement when I recently found the book in a box in my garage. 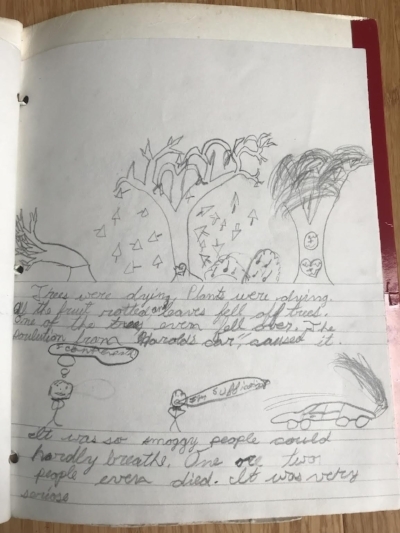 Below is the book in all of it’s 3rd grade glory, pictures and all. Harold the Great Inventor brought out a picture of a special car that could fly, spin on its back wheels and had a T.V. and a computer inside. It was called a trickster. The only bad thing was that it used a lot of gas. Almost everybody in town was in line for the car. There were so many people in line that Harold had to hire people to lower the rate of people. He hired six people. There were seven lines and seven offices. Harold’s place was packed! The competitor, Nancy Edwards, product was not selling because it was not as flashy and did not run as fast. But on the other hand, it didn’t pollute and took in smog. Nancy’s office used to be packed like Harold’s. But that was before Harold’s product. But now it looked almost exactly like the picture. Not a soul had come in in the last month. Everybody starting look at Nancy’s car. And almost everybody returned Harold’s product. They practically bought all of Nancy’s product. The business was back to normal! All of the polluted area cleared up! Leaves are on trees and fruit is ripe!